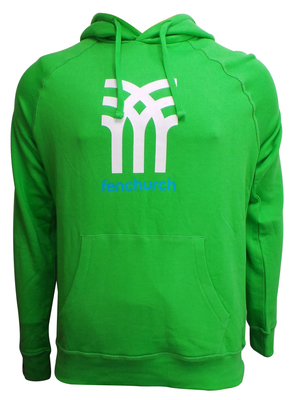 You will receive 10 Fenchurch Mens Icon Logo Hoodies. Mens icon hoodies from Fenchurch. Features a white/blue branded print displaying the Fenchurch logo. Also features a front pouch pocket. Regular fit. Hood features custom-fit drawcords. Sleeve cuffs and hem are ribbed. Hoodies come in 2 slightly different shades of green.